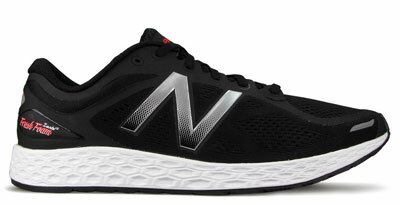 New Balance's marketing pitch: Neutral cushioning shoe for fast speeds. 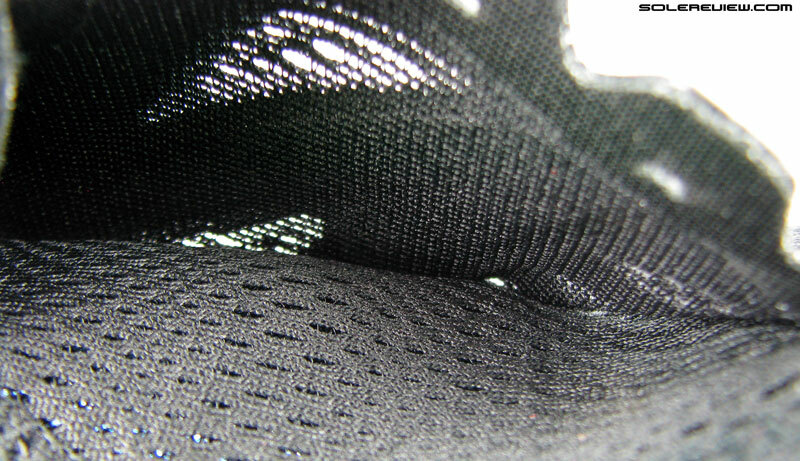 Surfaces tested on: Road, ambient temperature of 22° C/72° F.
Upper: Mesh, fused synthetic, midfoot sleeve. 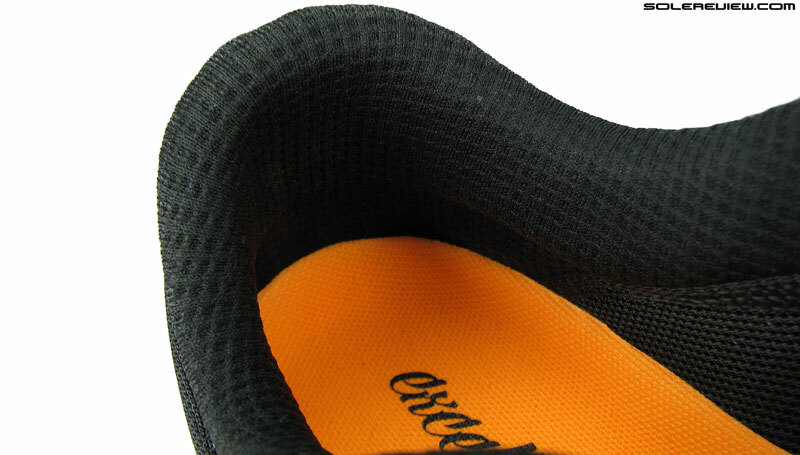 Midsole: Single density compression molded foam. 6 mm heel drop. Weight: 267 gms/ 9.4 Oz for a half pair of Men's US 11/UK 10.5/EUR 45/CM 29. 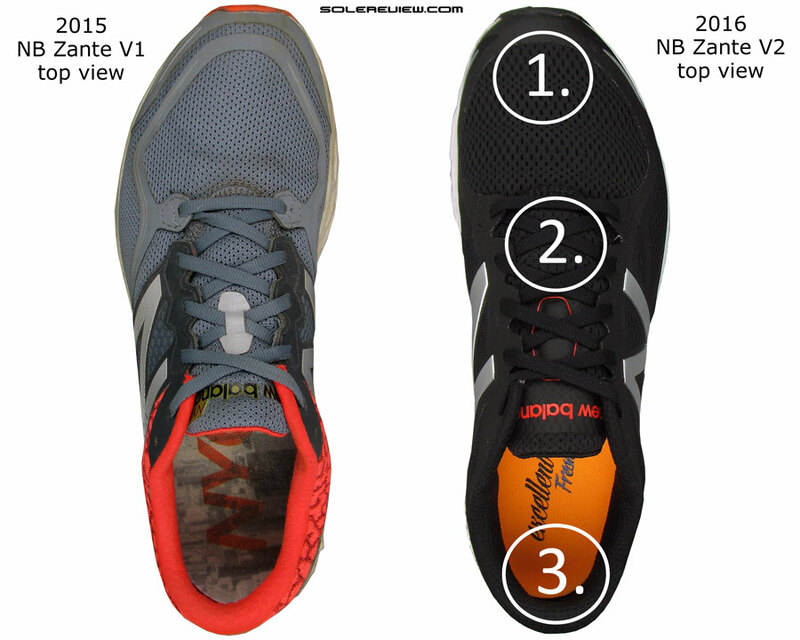 The Zante V2 gets a major upper design and fit update, and the ride is much firmer. The shoe which started all things Fresh Foam – the New Balance 980. 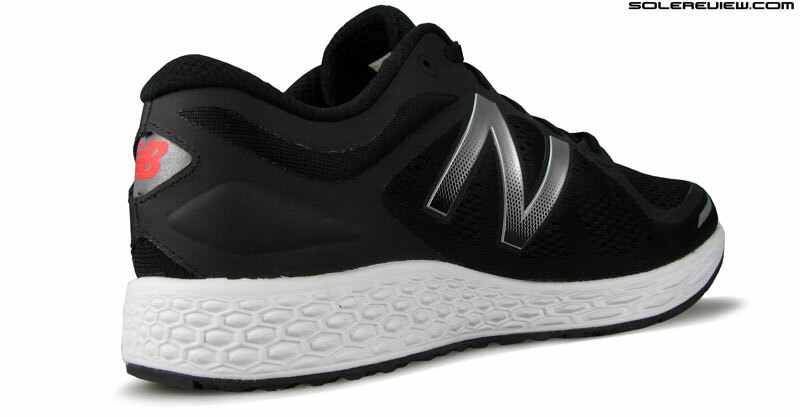 When we reviewed the Fresh Foam 980 a few years ago, we weren’t impressed by New Balance’s ‘science of soft’ marketing claims. The truth was that the 980 was a firm and an ordinary riding shoe which felt soft because of its insole. 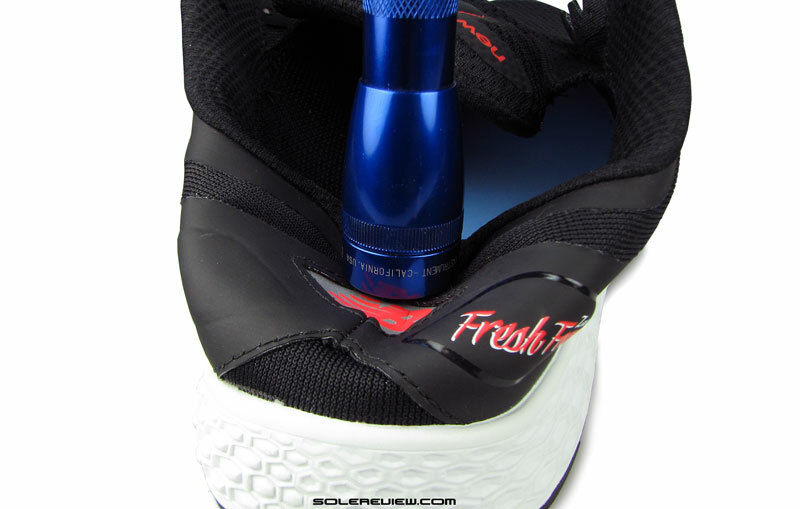 More recently, reviewing the 1080 V6 led to a similar opinion about the Fresh Foam platform. The 2015 Fresh Foam Zante proved an exception. We reviewed the shoe not long after we did the 980, and the difference in ride quality came as a pleasant surprise. Not only did the shoe feel soft, but responsive as well. The Zante V1 – the Fresh Foam outlier. The reason behind the original Zante’s ride improvement over the 980 (and 1080 V6) has to do with a couple of factors. One, the midsole foam is softer to begin with, and two, the midsole has lower stack height(s). Combine these two together, and the result is a soft and responsive ride. The lower midsole height allows a runner to make the most of the soft foam’s compression properties, which also leads to a heightened feel of rebound. This behavior isn’t a surprise, because we’ve seen this play out on other shoes too. 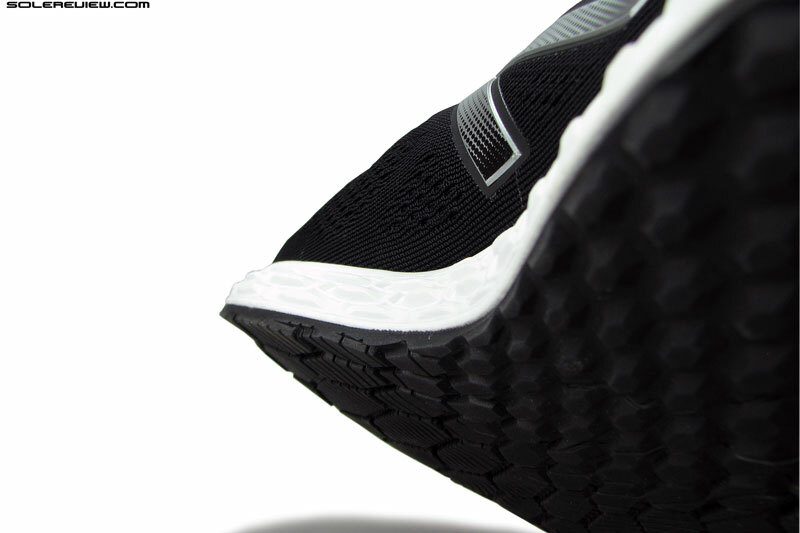 Take adidas’ Boost midsole technology for example. 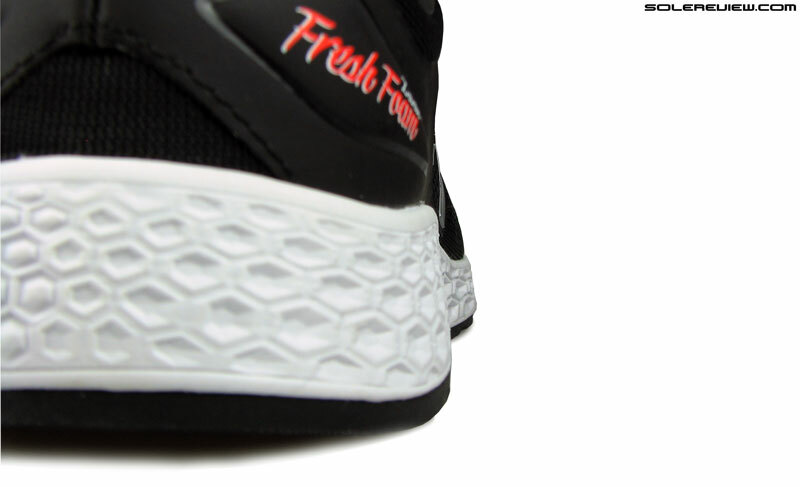 The fused cluster of foam globes rides better than any other midsole foam available today, but there’s a caveat. Boost performs best when used in moderation. What are the ingredients of a responsive ride? Use too much of it – like in the Energy Boost for instance – and the shoe feels more soft than responsive. In lower stack height models such as the adios and Boston, the thinner Boost midsole rewards pace with responsiveness. The Glide Boost blends soft cushioning and responsive ride equally well. So you see, the problem of achieving the softness-responsiveness balance isn’t a Fresh Foam issue alone. There are other moving parts which impact a shoe’s ride, like the way in which the overall midsole is constructed. That explains why a chunky foam shoe like the Clifton can defy convention and feel soft and responsive at the same time. 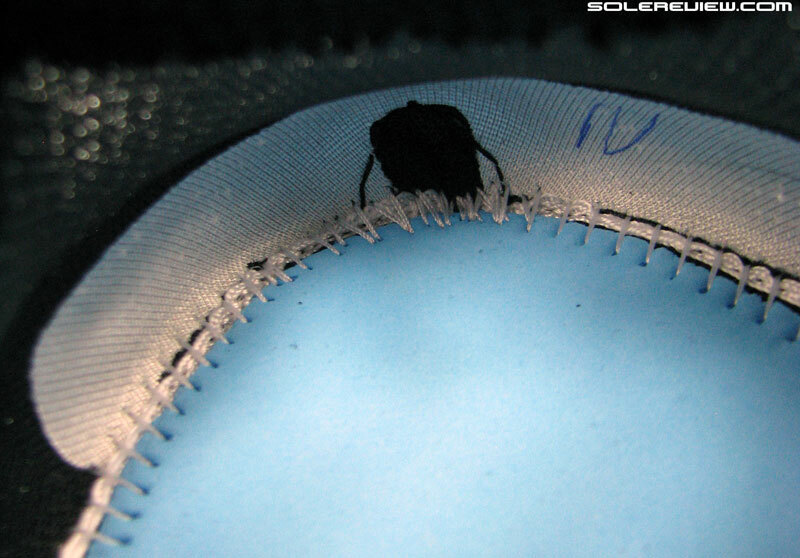 Midsole material tech rarely works in isolation. A running shoe is a sum of parts, and the midsole foam just happens to be one of the many. 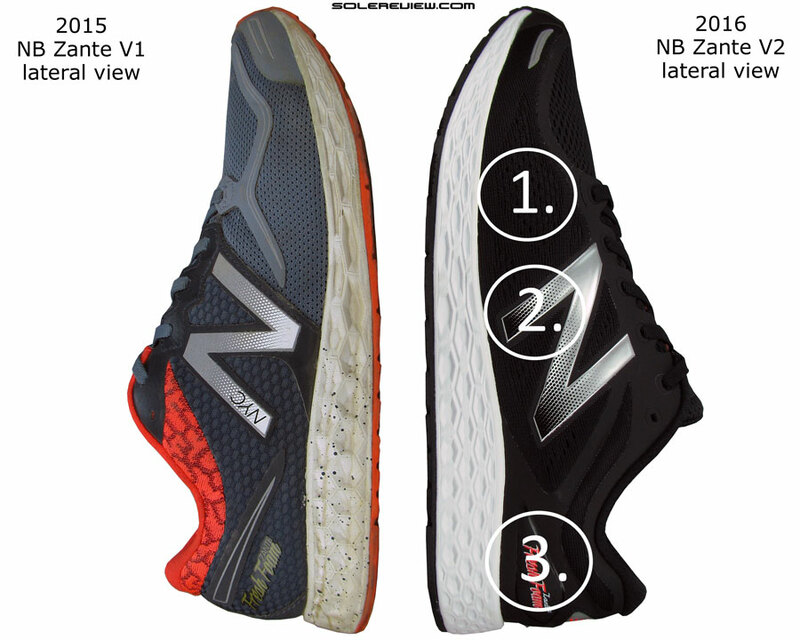 The Zante V2 = firmer ride+increased upper room versus the V1. The midsole has a hexagon embossed sidewall similar to the Zante V1, except with a firmer foam core. There are only two things you need to know about the Zante V2 if you’re considering switching from the Zante V1. The first is its significantly firmer ride than the V1, which is the result of a couple of things being done differently. The second update addresses some of the upper fit issues of the V1 – which is a good thing. The Zante V1 used a split eyestay and a stitched-on midfoot panel over the arch side. This made the inner midfoot a bit too snug for comfort. 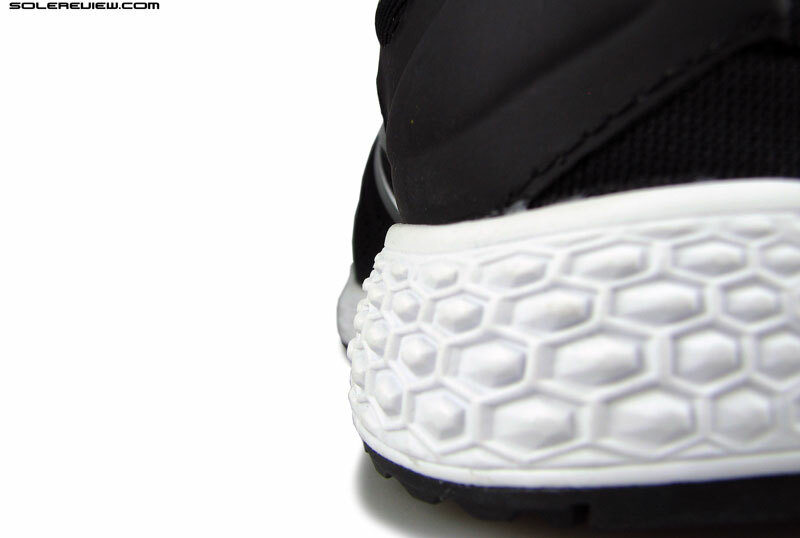 The V1’s toe-box was also shallow due to the thick, fused synthetic running over it. The Zante V2 introduces a slew of design revisions which frees up more room inside, besides making the midfoot fit more comfortable. It is best to begin with the kind of layering applied on the mesh upper because it contributes a lot to the quality of the interior environment. This year’s Zante ditches stitching in favor of fused overlays. 100% of the V2’s overlays (except on the heel) are of a fused kind, in contrast to the fused+stitched combination seen on the V1. The latter had stitching running over the midfoot ‘N’ logo and lacing area; the Zante V2 does neither and instead opts to go stitch-less this year. Add a few other things to that as well. While most of the overlays on the V1’s upper was made of a thick synthetic, the Zante V2 dials down on material thickness. The 2016 upper uses layers which are of a thinner kind, hence making the V2’s silhouette appear more streamlined. The Zante V2 uses a thicker spacer mesh to cobble its upper. Squeeze it between your index finger and the thumb, and there’s a greater sense of give. On the other hand, the Zante 2 uses a spacer mesh variety with more volume. It is thicker, closer to what you’ll expect to see on traditional built-up trainers instead of a lightweight like yours truly. As mentioned previously, a peculiar quirk of the Zante V1 was its split lacing eyestay. In other words, its first and second rows of lacing were fixed on two separate pieces of eyestay. This design dialed up the lacing pressure at the front, as the first row exerted lacing pressure independent of the rest. The lacing eyestay is a single piece this year – no split rows here. The Zante V2 makes an update to the eyestay, and entire lacing panel is built using a single piece of fused synthetic. This particular update not only produces an even quality of lacing pressure but also opens up space inside the forefoot. Also helping increase the Zante V2’s forefoot room are the lack of layers on the upper mesh. As seen in these side-by-side pictures, the V2 gets rid of the strips on both the medial (inner) and lateral (outer) forefoot mesh areas. The toe-box area is cleaned up. The V2 removes the synthetic strip used over the V1’s toe area. The external redesign translates to an increase in internal toe-box space. The toe bumper set-up has changed for the better too. The Zante V2 removes the synthetic strip of the year past, and transitions to a unified component made of the same fused synthetic used for making the rest of the upper. We love the way how the fused upper layering is nearly one piece; except for a small joint on the medial side, the overlay extends all the way up to the heel. With the toe-box losing the synthetic strip, the Zante V2’s front-end has increased vertical room. In retrospect, the toe-box design of the V1 felt comparatively shallow due to the narrow strip overlaid on top. 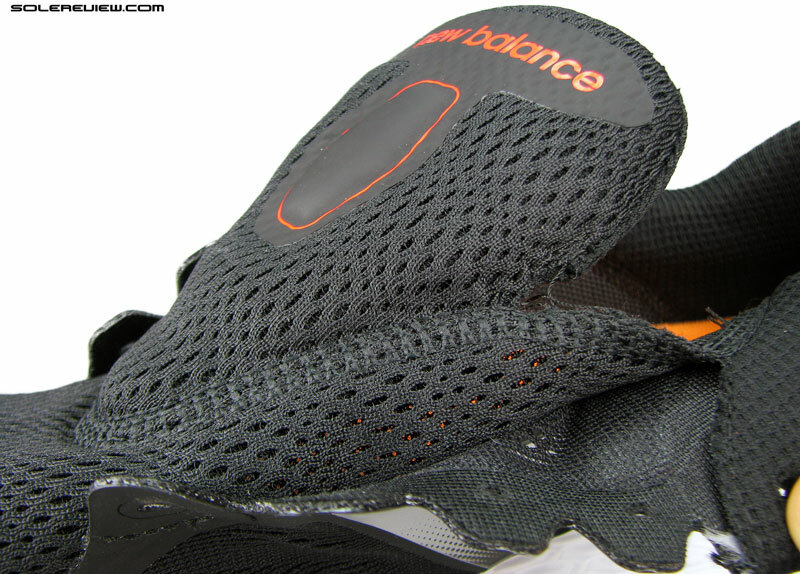 The midfoot panel floats over the inner sleeve and is attached to the forefoot by means of stitch-free fusing. The 2016 Zante 2 uses an inner sleeve like the Z1 – with a small update inside. 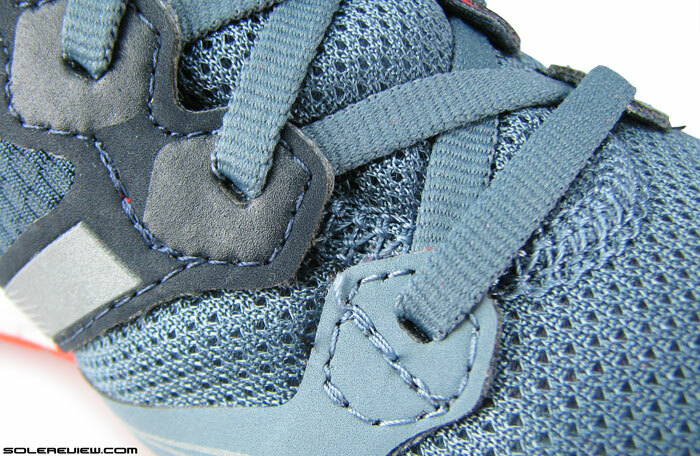 Using a fused midfoot ‘N’ logo (on the outside) helps remove the stitched line inside the upper. The result? A much smoother interior environment. The 2016 Zante V2’s midfoot is smoother for a couple of reasons. Firstly, removing the split lacing eyestay translates into (a more) consistent forefoot and midfoot fit. 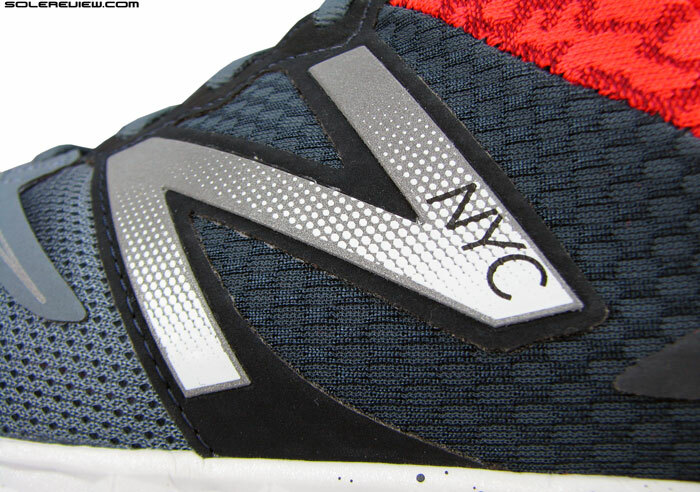 Secondly, the New Balance logo is devoid of any stitching this time. 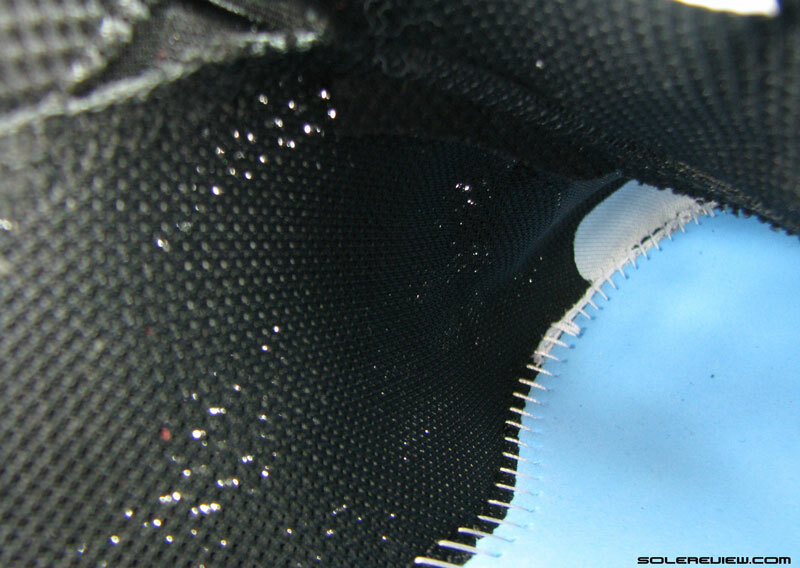 So if you run your fingers over the V2’s inner lining, you encounter zero stitching. This makes the insides of the V2 better. 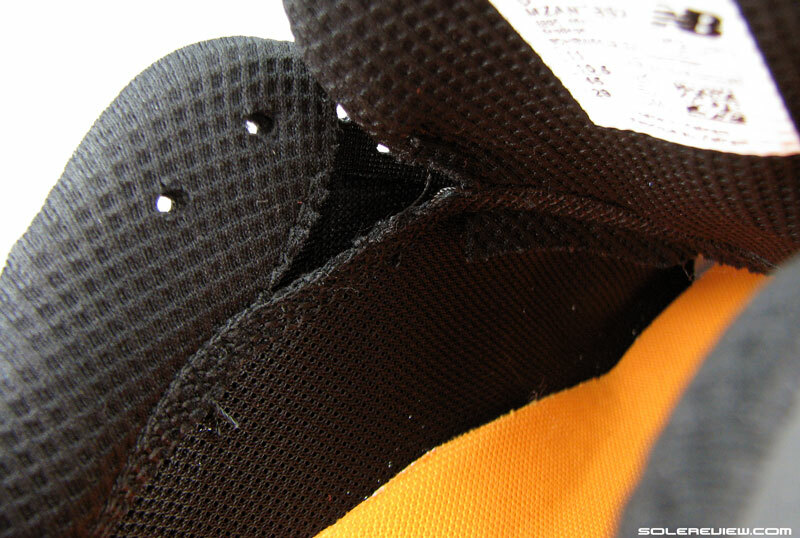 The collar fabric used on the V2 has a coarser hand feel, and the entire heel is stiffer compared to the V1. The V2’s heel fit has a more built-up feel, because it actually is. The original Zante’s collar edges were softer because the fabric used was a softer kind, and the outer side did not have synthetic layering. The synthetic layering on the Zante V2’s (right) heel extends higher, making the upper collar edges firmer. This section is still semi-collapsible, but the entire heel now has a lot more structure. Reflective elements are located on both front and rear sections. On the outside, the fused synthetic extends right up to the collar edge, in stark contrast to the deconstructed design of the Zante V1. There’s also a lot of material over the heel, as the Zante V2 brings together a reflective panel and a foam-molded synthetic with text branding around that area. So the heel counter has a lot more structure versus the Zante V1. 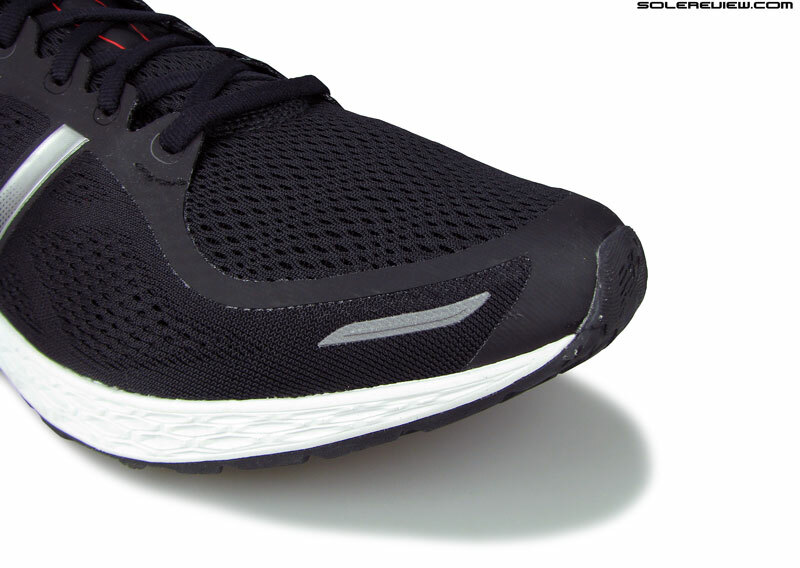 Nothing wrong with the heel design or grip per se, but it feels out of place on what is supposed to a lightweight running shoe. And these factors do add weight – consider the massive weight gain of 32 grams/1.1 ounces over the Zante V1. That’s a 14 % weight gain over 2015. There appears to be another effect of the stiffer heel. The Zante V2 has slightly more room ahead of the toes compared to the V1. The previous Zante’s minimal heel counter moved the foot’s position backward by a couple of millimeters, whereas the V2’s solidly built heel eats into that allowance. Still, no need to upsize because the margin being discussed here is within sizing tolerance. 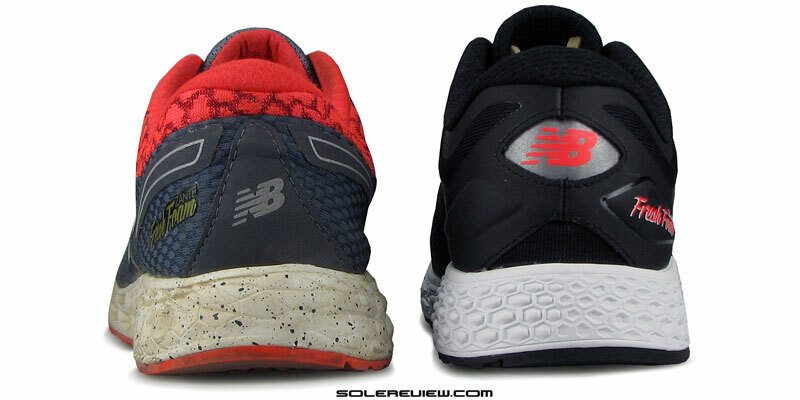 The lasting design has stayed the same, but the insole above it hasn’t. The V2 sockliner looks similar from afar, and yet differs significantly. One area which needs underscoring is that the Zante V2’s upper fit feels roomy overall from heel to toe, something which cannot be explained by the previously described nip and tucks. Runners switching to the V2 from Zante V1 must be left wondering whether there’s anything else at play here. Your gut feel isn’t misplaced because the new insole design frees up a bit of upper room. Nothing seems amiss at first; it is only when you go running in the V2 that you realize that not only is the ride much firmer, but flatter too. As it turns out, the reason #1 is the much thinner sockliner placed inside the Zante 2. 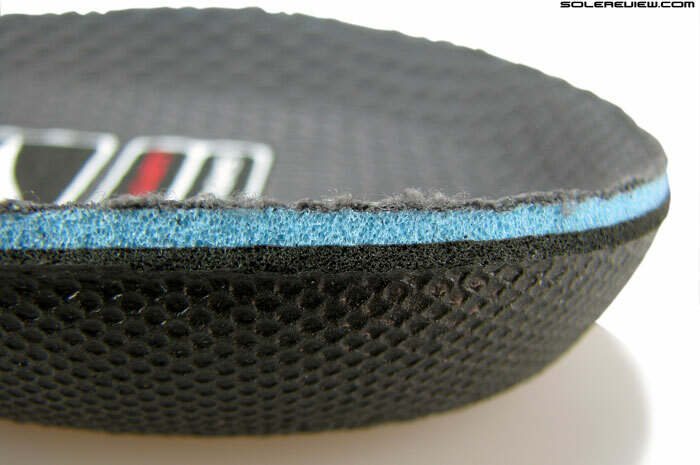 This foam insole is only half as thick as the type used in the Zante V1. 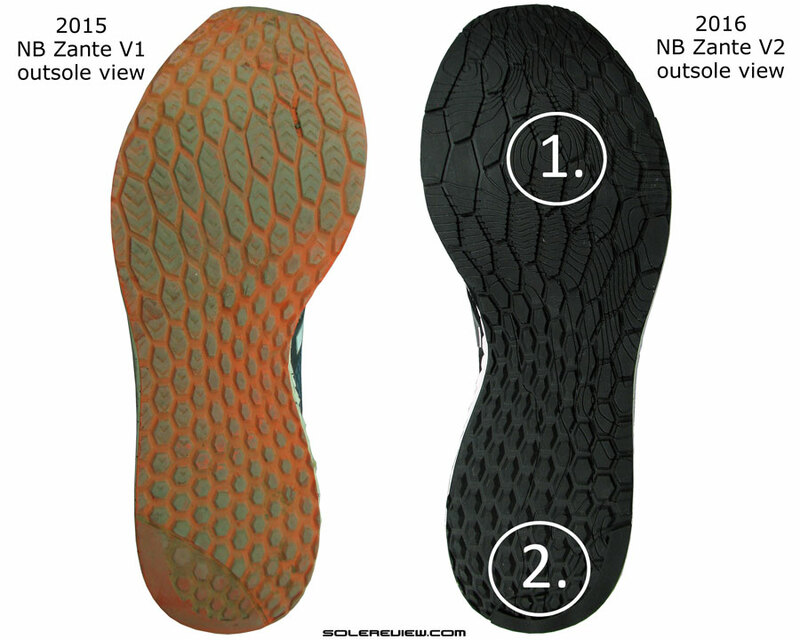 The Zante 2’s insole (top, orange) is only half as thick as the Zante V1’s kind (bottom). The Zante V1 had a perforated insole with a chunky feel because it was twice as thick as the one used on the 2016 model. The Zante V2 uses an insole which is straight out of vintage Hoka One One’s playbook. The insole is compression molded, yes, but of a crepe-y thin kind. Experienced runners realize the extent of influence an insole can have on a ride. In many shoes, it can make up for the shortcomings of the midsole, and on others (Beast) the insole can end up being an independent cushioning ecosystem in itself. Remove the insole of any shoe you perceive as ‘responsive’, and then head out for a quick 3K run. The ‘responsive’ effect is all but gone, and what’s left is a raw, flatter ride quality. Insoles and midsoles have always had a symbiotic relationship. 1) The forefoot midsole hexagon design is convex shaped instead of Zante 1’s concave sidewalls, which makes the 2016 Zante firmer 2) The thinner insole opens up more upper space 3) The heel has a lot more synthetic layering than the Zante 1. Though the reason #2 for the Zante V2’s firmer ride is indeed a midsole made of firmer foam, it doesn’t take away from the fact that the insole plays a major role in affecting the cushioning behavior. There are also design updates on the medial forefoot midsole which made the 2015 Zante V1 easier to compress than the 2016 V2. The 2016 design has protruding hexagons (convex) in its sidewall instead of the easier-to-compress concave ones used on the Zante V1. So for whatever it is worth – the Zante V2 is a firmer shoe than the V1. The V1 had a bouncy quality to its ride – and more responsive – whereas the V2’s ride feels somewhere between the ultra firm Vazee Pace and the softer Zante V1. Firmer midsole equals a supportive ride. Like all firm shoes, the Zante V2 has its upsides over the V1 when it comes to the support aspect. The updated midsole enhances the supportive feel, as the foam is less prone to compression than the V1 was. 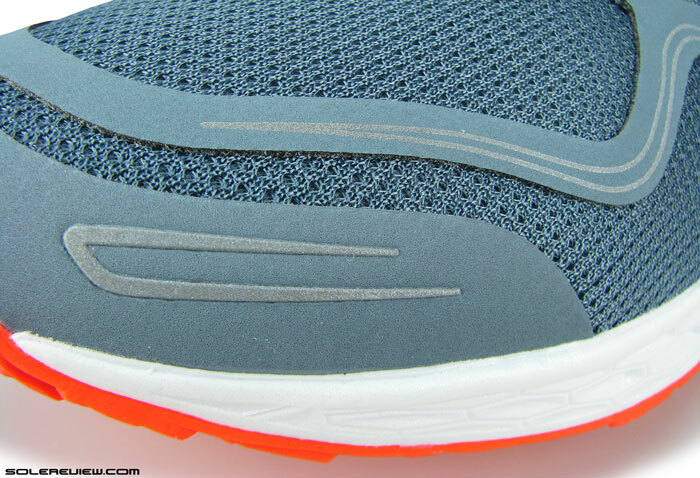 The same firmness also makes the Zante V2 feel faster to run, a trait it shares with the Vazee Pace. Decreased levels of foam compression might not bode well for sensory comfort, but it makes the transitions feel faster and more economical. 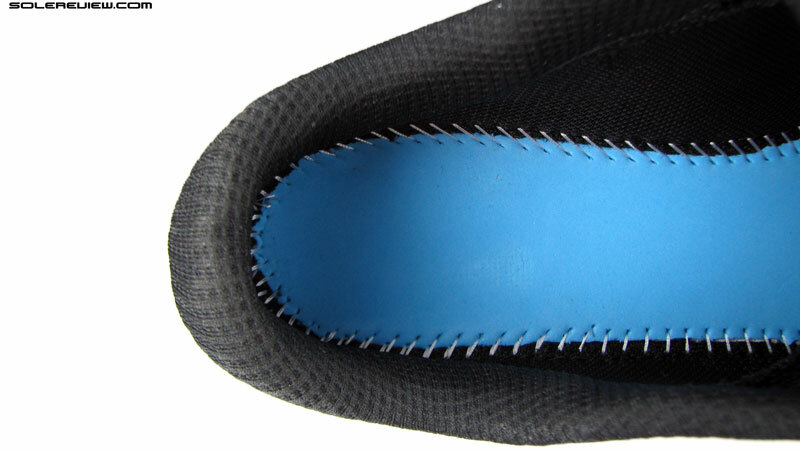 1) The forefoot outsole lugs have deeper grooving and better grip 2) The harder heel crash pad is smaller in size. And finally, getting to the bottom of things – literally speaking. The Zante V2 adopts a full rubber coverage approach with respect to outsole design, in a way which is similar to the Zante 1. Even the hexagonal lug shapes have an aesthetic borrowed from the first generation Zante. The changes aren’t major, but they’re still worth calling out. 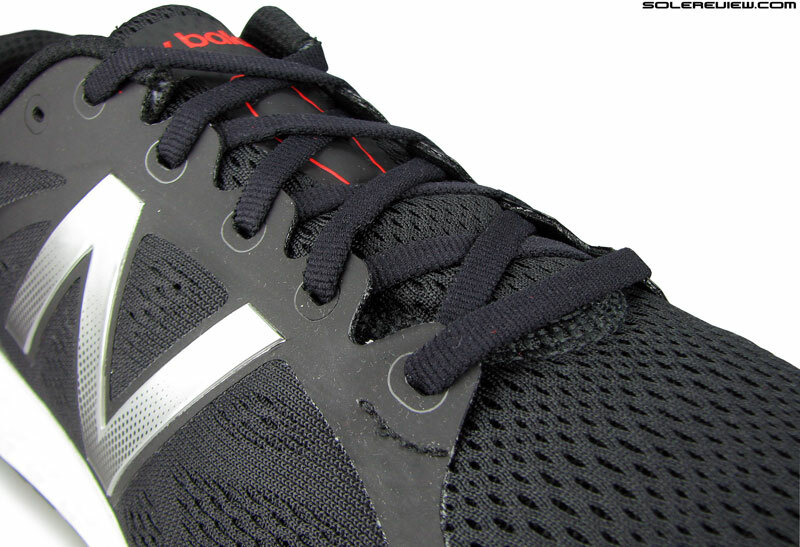 The forefoot lugs have deeper threading which improves the grip quality under the front-end. There are tweaks under the rearfoot too, with the harder rubber crash pad shrinking in size. This is a firmer and heavier Zante with a roomier upper fit, so know what you’re buying. On a personal note, our ideal choice would be an imaginary Zante which combines the previous Zante V1’s ride quality combined with the reworked upper fit of the V2. Though the Zante V2 is adequately padded , the bounce isn’t there and the increased weight brings it closer to a regular weight category. So it’s kinda in the middle. The Zante V2 is still sufficiently differentiated regardless of the change. It improves on the upper fit which most people liked on the V1, and the cushioning will take you comfortably to a HM distance without producing any mushiness. Regardless of its competence, it delivers a ride character different from the original Zante V1 – thanks to the 50% discount on insole thickness, plus the reworked midsole. 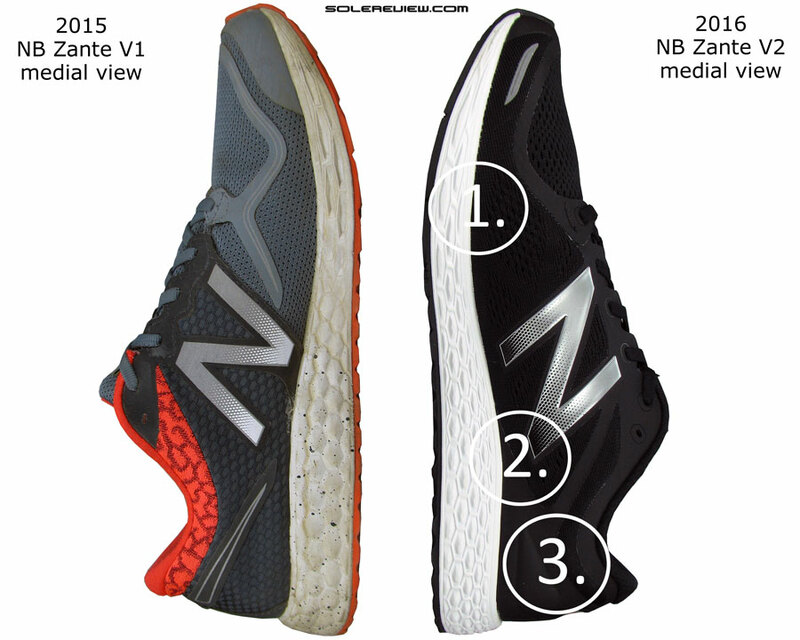 Looking to upgrade your 2015 New Balance Fresh Foam Zante V1 to the latest version, but not sure how the 2016 model compares? We can help here. 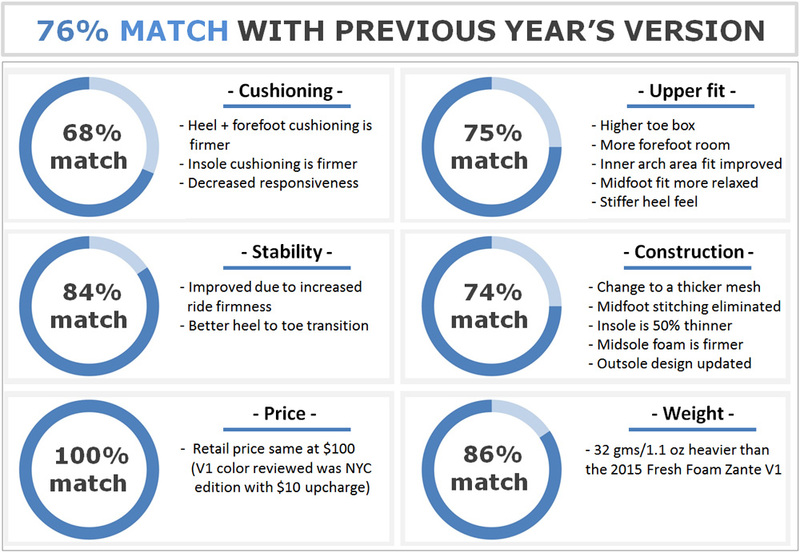 The following infographic is a ready-reckoner for what changes you might expect in the new model vs. old. To make this more fun, we’ve put in a system of percentage match, which calculates a weighted average for a set of attributes.